Very cool txemijendrix ! Thank you very much ! This is the how to for Itask-ng. 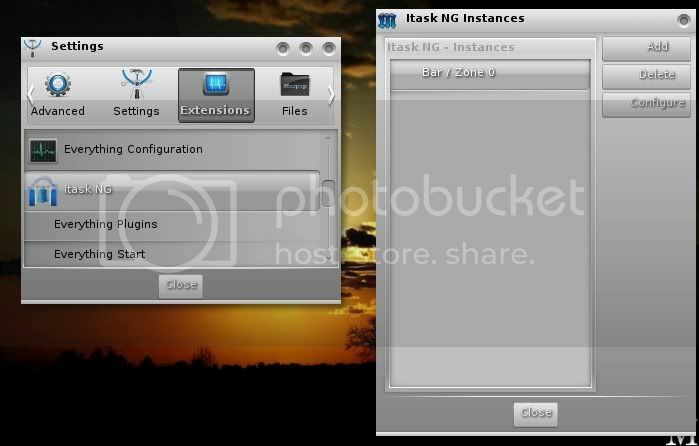 To load Itask-ng open the setting panel and go over to extensions and click on Itask-ng. In the window that opens click add. Select the bar you just added and click configure. 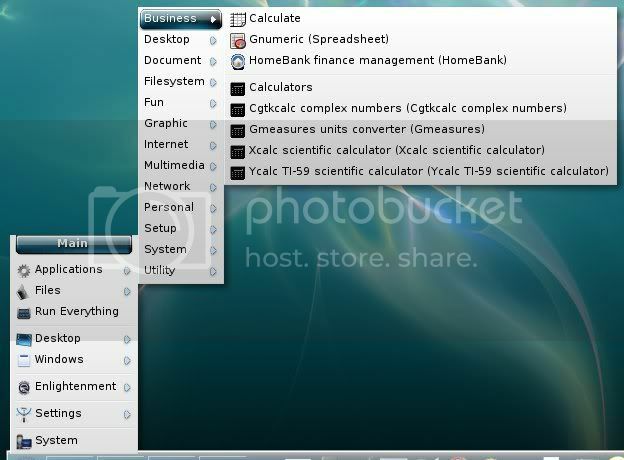 The Itask-ng configure window will open. Here you can adjust the size of the icons,the location of itask.Etc. You can also open this window form Menu-settings-itask-ng now.If Itask-ng isn't running the window won't open. 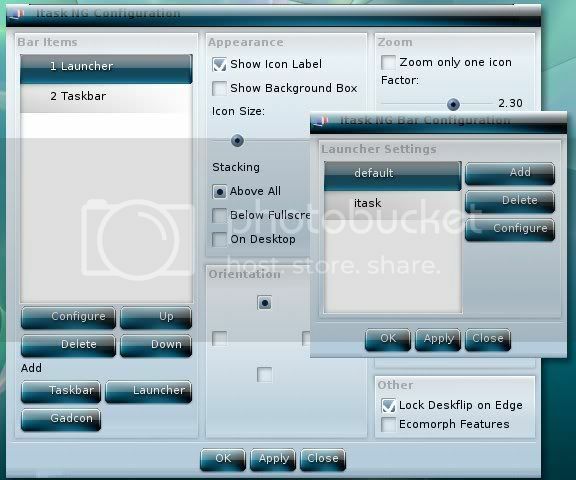 If you then click on the Launcher and then configure you can change to a customized list of apps and make adjustments just like the ibar. 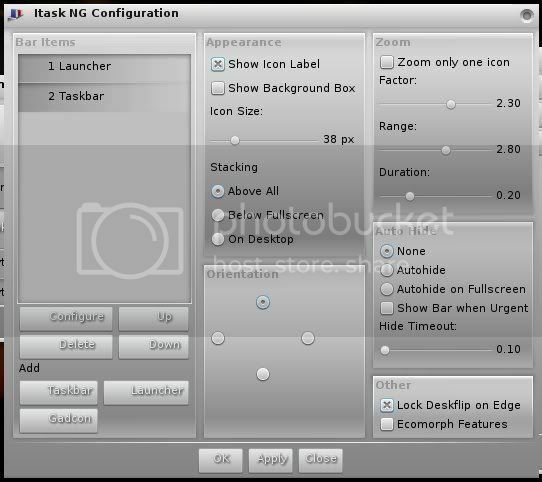 The version of Itask-ng that macpup has will have reflections under the icons this causes problems if you place itask-ng on one of the sides or the top of the desktop. Install the Itask-ng-02 .pet to get rid of the reflections. I recommend installing the .pet while Itask-ng is not running. Thanks again, runtt and company for another masterpiece. Macpup is perhaps the most handsome and fastest e17 distro out there. Unfortunately, the Places module/gadget doesn't work. It is the more convenient and better looking alternative to pmount. Anyone able to make it work? @ ragman, pri made a pet that will put drive icons on the deskop . I have never used it. But it might help you. My evo has some special keys for sound,media,internet and I was able to get the sound keybindings working but not the media,internet,mail or search buttons. It also has a scroll button below the touchpad that is working also. I tried to setup my keyboard using the keyboard wizard but there are no kbs listed to change to. Sir, Thank you very much !!! They are getting better. 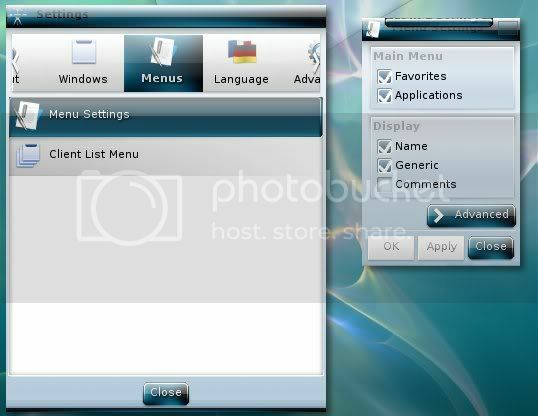 A few words about the e file manager(EFM) To open efm go to menu-files and pick one of the four location and efm will open there. Home will put you in /root , Desktop will put you in /root/desktop. 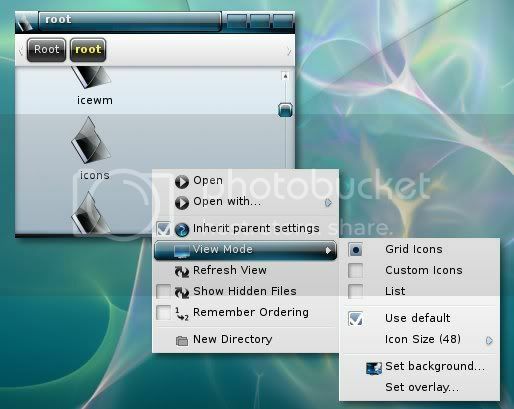 Favorites will put you in /root/.e/e/fileman/favorites , I have no idea why it just does. root will put you in / . 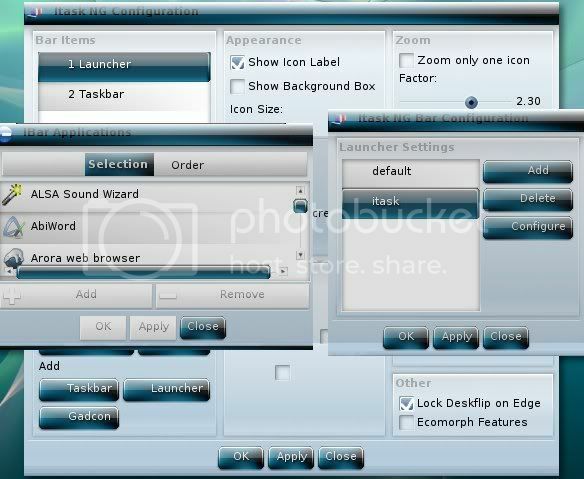 right clicking inside efm will give you several options. There are more in the settings panel. Be careful with it.When you drag and drop from one folder to another it will move but won't give you the option to copy. I don't use efm very much.So I didn't set most of the run options so clicking on text or videos won't do anything..This has caused some new people some problems cause clicking on a .pet or .deb in emf won't install it. I recommend using rox. Thank you very much. Pri's pet will do for now. Thank you runtt for explaining how to get/open EFM. I know that in the past with your puplet, or with other distros using e16/e17, I've always tried using EFM and have found it "somewhat" confusing. This time I tried finding it in "Files" and couldn't find a way to open it. DUH! Now I know why. I had even wondered whether or not you might possibly have just not have installed it. And as Paul Harvey used to say, "Now you know the rest of the story!" Looks to me like EFM has grown up tremendously since even as little awhile ago a just a year. Or so it would seem to me at least! I could be all wet behind the ears of course. I will say a few things though runtt: The MORE I keep using this Macpup-511 the more I realise that this newest version of e17 has finally come of its own - has come to fruitition. It has spent a very long time trying to blossom... and now it has clearly become a flawless and rare rose in a sea of daisies ( "other window managers & desktops" ). Where in the past this desktop could be quite complicated to use, to configure, and very unstable - it now seems to possess the stability of bedrock. And for ease of use? Well, if this mostly brain-dead person here can use it AND easily figure out the various settings then anyone else should be able to do likewise without any problem whatsoever! In closing runtt I'd also like to add that I've been enjoying your little "howto's" here and there throughout this thread as they've helped me to understand the various assorted hidden gems I had yet to find ( like the EFM for instance ). Keep up the fabulous work mate! A winner bar none, Macpup-511 truly IS the Beauty of Linux! This is both a How to and a FYI about the menus.When you add a app they update by themselves. 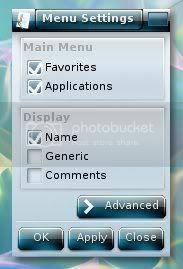 The settings are controlled in the settings panel under the menu tab. 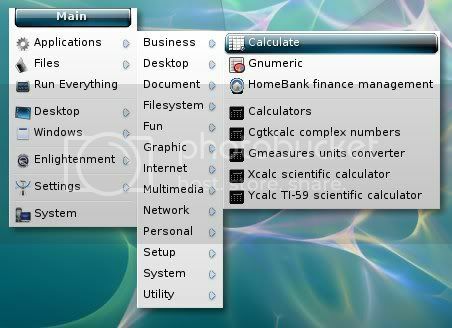 There are a few more settings if you click the advanced tab.By default Macpup shows both the apps name and what e calls the generic.Thats why most of the apps show dual names with the generic in (). The reason I do this is because in the submenus e list categories like it does apps. In the pic both calculate and calculators will "light up " like apps do ,but clicking on them does nothing cause they are not apps.Most of the real apps will have the generic by the app name. To turn the generic off uncheck generic in the setting panel ,then apply. Then your menus will look like this .